Coats says cyberattacks a top threat to U.S. Leaders of the intelligence community said the United States is "under attack" as it relates to the nation's cybersecurity posture heading into the 2018 midterm elections. 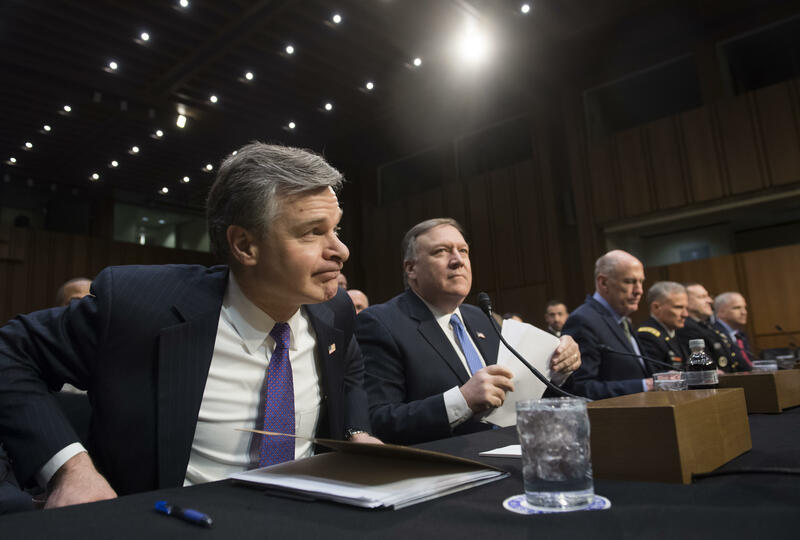 FBI Director Christopher Wray, CIA Director Mike Pompeo, and Director of National Intelligence Dan Coats joined other intelligence heads by offering testimony on worldwide threats facing the U.S. and its allies on Capitol Hill on Tuesday. The intelligence chiefs appeared to be in consensus that the threat against the U.S.' cybersecurity is a top priority for the intelligence community and actors like Russia show little sign of slowing down their efforts to sow discord and dissension in the United States. In his opening remarks, Coats said that the U.S. is "under attack" by "entities using cyber to penetrate virtually every major action that takes place in the U.S."
He said that from the business world to local governments, the U.S. is "threatened by cyberattacks every day" by using elections as an opportunity to "sow discord and undermine our values." Coats pointed to Russia, China and Iran as posting the greatest threat to the nation's cybersecurity presence, saying that Russia is a likely to pursue "more agressive attacks with intent to degrade Democratic values" as well as global alliances. Lawmakers, however, were dissatisfied that a proper roadmap to fixing and preventing the issue of cyberattacks on the U.S. has not yet been established. Sen. Angus King of Maine argued that there was not a clear "doctrine" that dictates what the U.S. response and consequences are when bad actors infiltrate the nation's cybersecurity posture. Pompeo noted that the intelligence community does have "some capabilities offensively to raise the costs for those who would dare challenge the United States elections." He agreed that a proper response was needed to such a "complicated problem" and urged a "U.S. government strategy" to addressing consequences. Coats echoed Pompeo, saying "our role as the intelligence community is to provide all the information we possibly can as its happening so policymakers can shape policy as to how we are going to respond to this in a whole of government way." He added, "It's just common sense if someone attacks you and there's no retribution or response, it's going to incentivize more contacts." Wray meanwhile suggested "creative and forward leaning ways to educate election officials" as the 2018 elections loom. Issues like North Korea's continued nuclear provocation was also addressed, which Pompeo said the U.S. can expect to see North Korea press ahead with additional nuclear tests, including an atmospheric nuclear test over the pacific. But domestic controversies currently playing out across Washington were also raised, including former White House staff secretary Rob Porter's security clearance and the Republican-crafted memo that alleged the FBI and Department of Justice improperly used a FISA application to surveil on Trump associates. Wray's timeline of the FBI's background investigation into Porter and the process in which the bureau alerted White House officials appears to contradict the White House's telling of events. The new details add to the further complications in the administration's response to handling Porter's resignation amid allegations of domestic abuse. Coats pointed to Russia, China and Iran as posting the greatest threat to the nation's cybersecurity posture, saying that Russia is a likely to pursue "more agressive attacks with intent to degrade Democratic values" as well as our global alliances. Asked by Sen. Warner on the chain of command when it comes to the intelligence community's response to cyber threats, Coats said no single agency is in charge but find many federal agencies are working together to keep the U.S. response moving and prevent further attacks from happening. Coats said the intelligence community is also gaining more support from the private sector. "We can't as a government direct them what to do, but we're spending every effort to work with them to provide answers," added Coats. Wray echoed the Director, saying the team effort on the part of the intelligence community in its effort to combat cyberattacks is more apparent than the last time he was a government role. Wray noted, however, that the federal government "can't fully police social media" so the intelligence community needs to work with tech companies to better prepare for future attacks. He commended the intelligence community's use of "defensive briefings" with U.S. telecommunication companies and members of the tech industry to help them "recognize the threats that are coming their way"
He said he's been "gratified" by the response he's received from companies when trying to educate them, but noted the bigger challenge is innovation -- smaller start up companies with less sophisticated measures to prevent cyberattacks. As it pertains to China, Wray said they are turning to more "creative avenues" by using "non-traditional collectors", an aspect Wray said the intelligence community recognizes but the private sector "isn't used to spotting." Coats says that Russia utilized social media as a relatively "cheap and low risk" opportunity to sow dissension in the U.S. He said in the eyes of Russia, it "offers plausible deniability and is proven to be effective at sowing division." He said that Russia will "continue using propaganda, social media, false flag personas and sympathetic spokesmen to build on its wide range of operations and exacerbate social and political issues in the U.S."
Coats noted that Russia perceived its past influence as "successful" and aims to use the 2018 midterm elections as a potential target. Director Pompeo added that intelligence officials have yet to sees a "significant decrease" in Russian activity as it pertains their influence in U.S. elections and social and political issues. Wray was asked by Sen. Ron Wyden about his knowledge of allegations of domestic abuse carried out by former White House staff secretary Rob Porter, creating security clearance issues at the White House. Wray said that while there was a limit to what he can say about the content of Porter's background investigation, he said he was confident the FBI followed "established protocols" when conducting the background investigation. Wray provided a brief timeline of when the FBI submitted its reports on the investigation as part of Porter's clearance process, saying that the investigation was completed in late July. He said the FBI soon thereafter received a request for a follow up inquiry which was provided in November. The file was then closed in January but said earlier this month, the FBI received "additional information" and passed that along to the proper agencies. Meanwhile, Coats said that North Korea continues to pose more than ever as an "increasing threat to the U.S." He said that the regime has stated it does not "intend to negotiate nuclear weapons away" which they deem critical to its security. Coats said that North Korean dictator Kim Jong Un sees nuclear ICBM's as leverage to end the alliance between South Korea and the U.S. in its efforts to "dominate the peninsula." He said that the nation can expect to see North Korea press ahead with additional nuclear tests, including an atmospheric nuclear test over the pacific. Pompeo echoed Coats' assessment of Kim, saying he continues to remain intent on staying power. He said that U.S. intelligence officials see that as the North Koreans ratchet up their nuclear capability it makes a response much more difficult and North Korea's capacity to do harm in the region also increases. Pompeo also addressed the Winter Olympic Games which has been a moment for diplomacy between the North and South. He said that Kim Jong Un's sister Kim Yo Jong, who led the regime's delegation to the Olympics, is the "head of propaganda and agitation department" and there has been "no indication" of a strategic shift for the North Koreans and its nuclear containment. He said that those around Kim "aren't suggesting to him the tenuous nature of his position" as leader of the regime and the consequences of his actions in the peninsula. Wray said he did have interactions with the White House as it pertains to the since-declassified memo penned by House Intelligence Chairman Devin Nunes. He said, however that the FBI "had then and continues to have now grave concerns about the accuracy of the memo because of omissions." He added, "we provided thousands of documents that were very sensitive" as well as "lots" of briefings so it's "very hard for anybody to distill that down to 3 and a half pages." CBS News' Emily Tillett contributed to this report.